We know that “Chin Chin” played at the Metropolitan Opera House in Minneapolis from February 1st through the 7th. 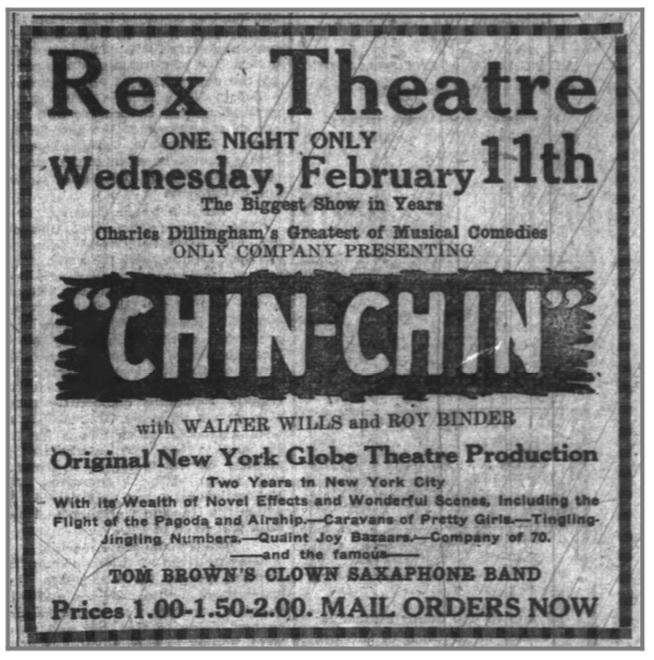 I do not have any known venues the 8th, 9th, or 10th, but on the 11th, “Chin Chin” played at the Rex Theater in Chippewa Falls, Wisconsin. Newspapers Mentioned “Chin Chin” was arriving on the 4th of February. [i] A standard full column ad played on February 6th, as did the familiar Wills, Binder, and Girls looking like Brussel sprouts on the stars’ queues. The music of Ivan Caryll, which serves to illustrate the story of “Chin Chin” which comes to the Rex tomorrow and in which Walter Wills and Roy Binder demonstrate their wonderful powers of drollery, to say nothing of their skill in dancing, is a demonstration of the wisdom of serving the best kind of music even to an extravaganza. “Chin Chin” is one more proof that good music pays. Music and dancing are so closely allied in these latter days. Ethel Lawrence as “Violet Bond” the American girl in “Chin Chin,” is a charming little actress and always succeeds in winning the good graces of the audience. Her rendition of the duet, “Love Moon,” with the aid of George Usher as Aladdin, is one of the particular bright spots of the show. We advise that you procure your tickest now. The sale is heavy and the theatre management cannot guarantee to hold any reservations after 6 p. m. Wednesday. “Chin Chin” proves Fine Attraction. Capacity House Pleased with Production at Rex Theatre Last Evening. Chin Chin came up fully to all expectations…. The Rex Theatre was originally built in 1906 and named the Victor Theatre. The Victor was a modest theater with a seating capacity of 900 people. The theatre changed its name to the Rex Theater sometime between 1918 and 1920, when “Chin Chin” played there. Ravoli Theater. Photo courtesy Tiny LouRugani via Cinema Treasurers. 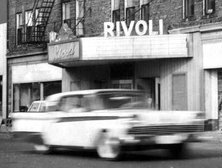 In 1930, the theater was renovated for motion pictures, and was reopened as the “Ravoli Theater.” The Ravoli closed sometime before 1960. The building was demolished by 1962. [ii] Today, the location is a Holiday Gas Station.